Randolph’s Leap are a Glasgow-based musical project ranging from a solo act to an 8-piece band. They write pop music for unpopular people and specialise in creating a joyous, brass-tinged folk-pop racket centred around the self-deprecating, humorous and heart-warming songwriting of Adam Ross. released a number of EPs and homespun albums over the last few years. Including their compilation album ‘Introducing Randolph’s Leap’, their lo-fi double-album CD ‘The Curse of the Haunted Headphones / As Fast As A Man’ and mini-album ‘Real Anymore’. The band have won over many new fans thanks to their festival appearances at T in the Park, Celtic Connections, Wickerman and Green Man. The band featured in the BlogSound of 2013 and have recorded two sessions for Marc Riley’s 6Music show. 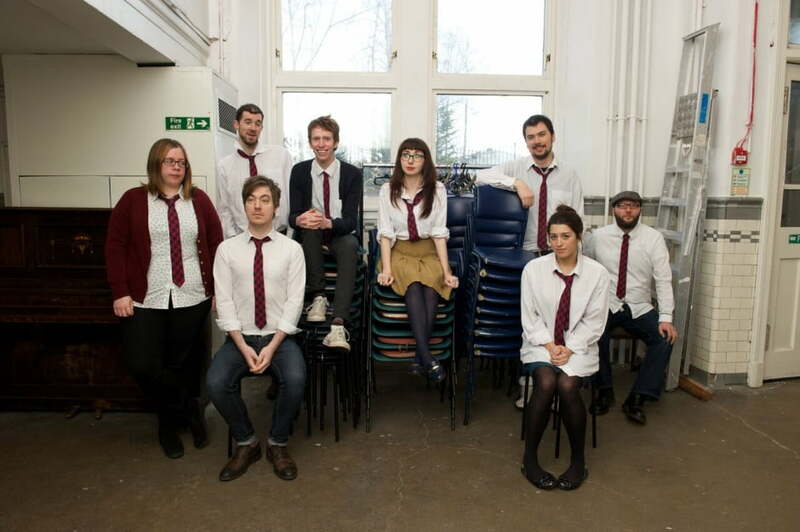 In Feb 2013 the octet played their biggest gig to date when they headlined the Queen’s Hall in Edinburgh.